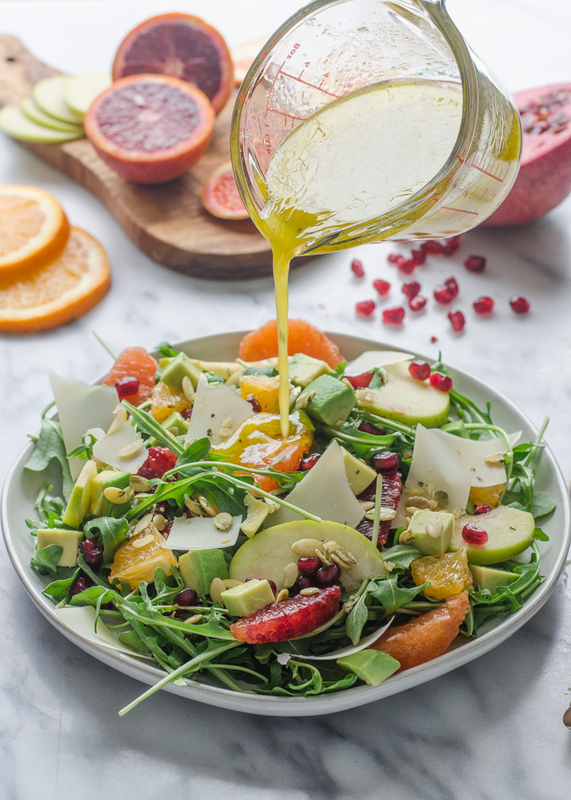 This arugula, avocado, and blood orange salad with orange vinaigrette is a yummy way to get your fruits and veggies in the winter! How has your winter been so far, friends? Ours is…very cold ATM. Tuesday we had a high of -22°F (yes: twenty-two BELOW zero for a HIGH), and today’s high is -19°F. Minnesota Januaries are no joke. Something that helps me through these bone-chilling months is all the lovely fruit that’s in season. 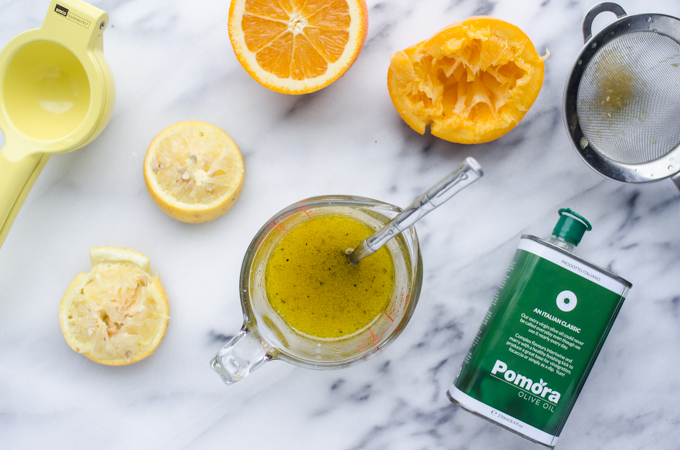 I adore citrus, and take all the chances I can to enjoy it during the winter. 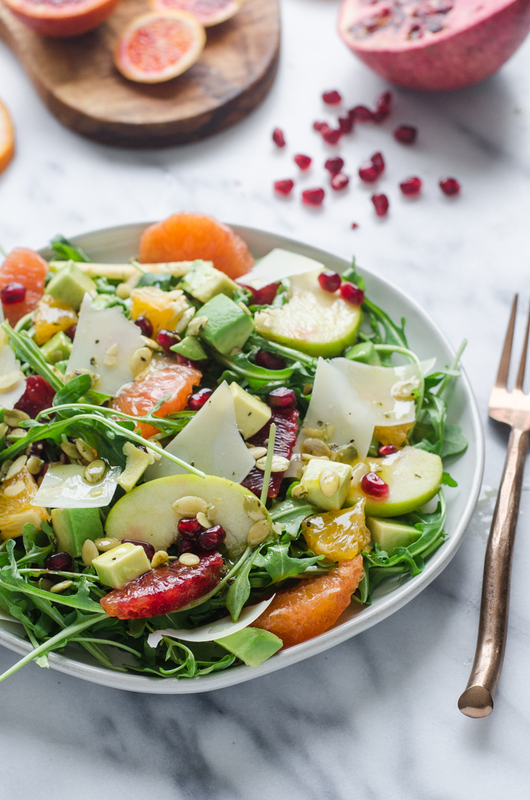 This winter salad features a variety of citrus fruits, as well as apples, pomegranates, and avocado. Yep, avocado is technically considered a fruit. Who knew?! I kind of went hog-wild with the fruit toppings. What can I say? I’m kind of extra when it comes to salad toppings. 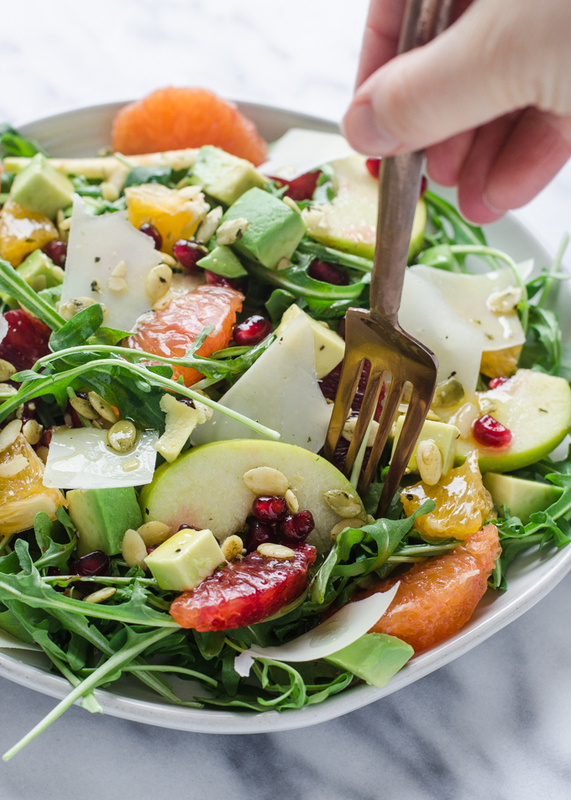 Load up a plate (or bowl – let’s face it, a bowl is more practical in terms of keep everything contained) with arugula. 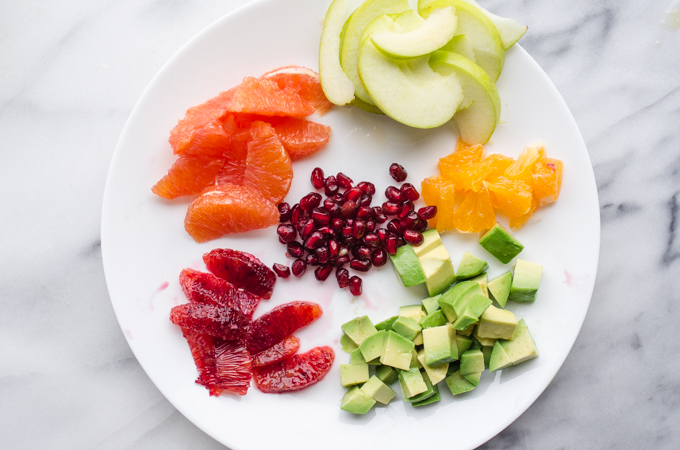 Add your fruits. Sprinkle on some Parmesan and sprouted pumpkin seeds. Pour some of the orange vinaigrette aaaaallll over the plate (or bowl). Devour immediately. Don’t feel bad about going back for seconds. BTW, those are Cara Cara oranges, not grapefruit! 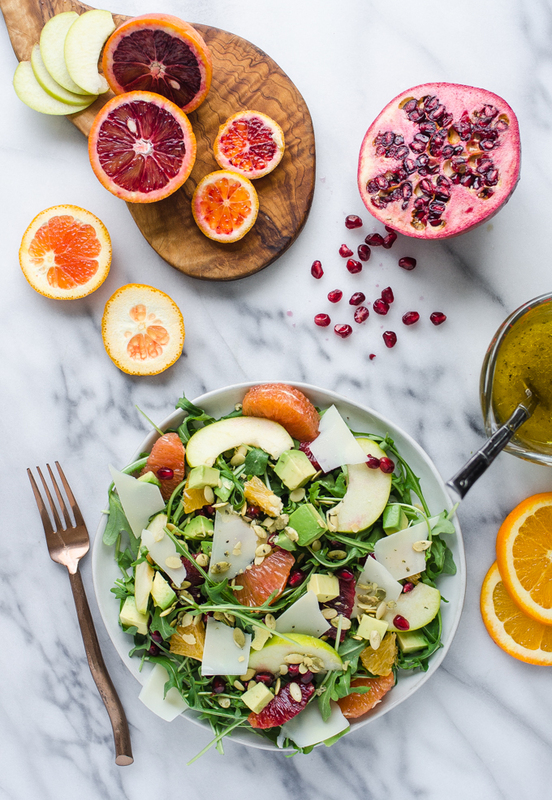 But feel free to use whatever citrus fruit you like in this winter salad! I’m curious: what do YOU like to put on your winter salads? Also, what foods get you through the winter? 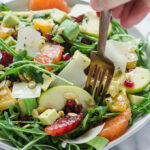 This winter salad is loaded with delicious in-season fruit. Place all ingredients in a jar and shake or whisk well to combine. Lay down a bed of arugula. 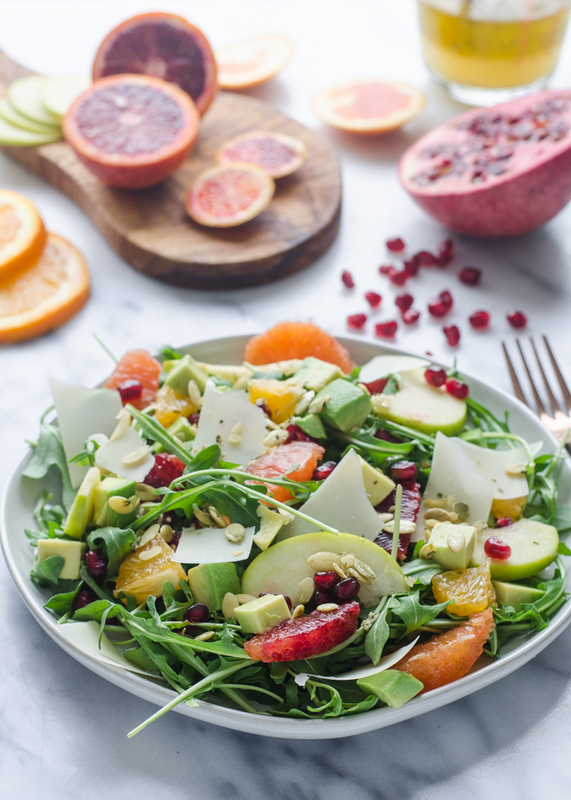 Top with fruit, pumpkin seeds, and Parmesan shavings to your desire. Drizzle orange vinaigrette on top. Serve immediately. « ButcherBox Review: NEW Wild Caught Salmon Box!